“Can you help my baby? He cannot walk.” Wow! What a question. This was asked of my evangelism partner in a small village outside Sengerema, Tanzania. My immediate thoughts were, “What can we do? We’re not doctors! We’re just plain, simple, ordinary people.” Thank goodness these were only my thoughts and did not linger long. As my friend put his hands on the child’s head and prayed for healing and blessing, I realized that there was much I could do. The reason I was in this small village in Tanzania was to share the Gospel message with the Sukuma people. In another village, after we told The Story, after we baptized, and after we explained the need to grow in their new faith by attending church regularly, reading the Bible, and sharing the Good News with others, we were asked another question. “How do I get a Bible so I can read more about Jesus?” Wow, another tough question! This time I thought, “There is much WE can do for the Sukuma people.” The support of our District’s partnership with the East of Lake Victoria Diocese of the Lutheran Church of Tanzania can provide answers to the above questions plus much more. We can share the hope that is found in the gospel of our Lord and Savior. 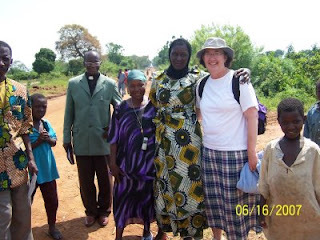 We can reach out to our fellow Lutheran brothers and sisters and provide the means to obtain Bibles and Lutheran hymnals in Swahili, support parish pastors, support and train village evangelists, assist with church building materials, up-date the audio visual equipment used to share the Message in an outdoor, rural setting. All of the above are being used in the Diocese right now but on a very limited basis. Parishioners and the Tanzania government have given land to build churches, they are making bricks and laying stone floors, evangelists go through the villages preaching and encouraging new Christians in addition to holding full-time jobs, pastors sometimes ride over 2 hours on a bicycle to reach a congregation on a particular Sunday. These, our brothers and sisters in Christ, love their Lord and are not afraid to work and put their faith in action. They just need our prayers, our support, our encouragement, and our love.